Austerity in America: Cutting Head Start and Medicaid is bad for kids and the economy. Imposing austerity on our youngest citizens is unfair. It’s also bad economics. 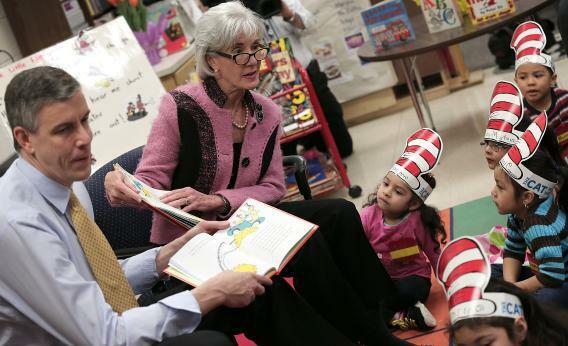 Education Secretary Arne Duncan and HHS Secretary Kathleen Sebelius to students enrolled in a Head Start program at Rolling Terrace Elementary School March 1, 2013 in Takoma Park, Md. When economists discuss “fiscal adjustment,” they typically frame it as an abstract and complex goal. But the issue is actually simple: Who will bear the brunt of measures to reduce the budget deficit? Either taxes have to go up for some people, or spending must fall—or both. “Fiscal adjustment” is jargon; what austerity is always about is the distribution of income. Much of Europe is already aware of this, of course. Now it’s America’s turn. And current indications there suggest that the people most directly in line for a fiscal squeeze are those who are least able to defend themselves—relatively poor children. For example, the current budget sequester is already hurting programs like Head Start, which supports preschool education. Jimmy Kimmel recently poked fun at his compatriots’ lack of fiscal knowledge by asking pedestrians on Hollywood Boulevard what they thought of “Obama’s decision to pardon the sequester and send it to Portugal.” The segment is hilarious but also sad, because the impact on some people’s lives is very real. About 70,000 children are likely to lose access to Head Start on our current fiscal course. And much larger cuts are in store for early-childhood nutrition programs and health care. Perhaps most shocking are the dramatic cuts to the Medicaid health-insurance program that the Republican majority in the House has embraced in its latest budget proposal. Paul Ryan proposes to balance the budget over the next 10 years largely by slashing the program. About half of all people covered by Medicaid are children. Think of it this way: In recent decades, some families chose locations and occupations that seemed to offer a reasonable means of support and good prospects for their children. Many of these decisions turned out badly, largely because information technology (computers and how they are used) eliminated many middle-class jobs. Increasing globalization of trade also did not help in this regard. In addition, as Till von Wachter of Columbia University has documented, prolonged periods of unemployment for parents have a severe and lasting negative impact on their children. Nor is America likely to provide such help in the future, given the coming budget cuts’ disproportionate impact on children at the lower end of the income distribution. America can easily afford to do better, of course. Its large budget deficits reflect the impact of tax breaks that favor the wealthy and upper middle class; an unfunded expansion of Medicare coverage to include prescription medicines; two foreign wars; and, most important, a banking system that was allowed to get out of control, inflicting massive disruption on the real economy (and thus on tax revenue). Today’s children did not play a role in any of these policy mistakes. The preschoolers who are about to lose access to Head Start weren’t even born when they were made. Imposing austerity on poor children is not just unfair; it is also bad economics. When economists, again with their dry jargon, talk about a country’s “human capital,” what they really mean is the cognitive and physical abilities of its people. As I pointed out in recent congressional testimony, poor education leads to poor job prospects, poor families, and back to poor education—if not with a detour through incarceration, which makes it even harder to break the cycle. Unfortunately, no one in a position of power is likely to heed such arguments. They should. When you travel to a foreign country for the first time, and you see neglected, ill-fed, and uneducated children, do you regard that country as likely to be one of the world’s great economic powers over the next half-century? Or do you worry for its future?